Bare concrete floors are ugly, and they don’t last very long if they are not protected. Oil from your car can leak onto your garage floors, permanently staining them and causing them to corrode. Chemicals in your workshop can do the same. Adding floor coatings to the concrete can seal it, protect it from damage, and make it easier to clean. Adding floor coatings can also color the concrete, give it a glossy sheen, and make it look much more attractive. You may be seduced by the availability of epoxy flooring kits and the ability to apply the coatings yourself. But you need to think very carefully about using a DIY epoxy flooring kit. DIY floor coatings tend to be much thinner than professional grade coatings. The reason has to do with the amount of solids in the mixture. The solids remain behind after the liquids in the mixture have dried, creating the coating. The fewer the solids, the thinner the coating. The thinner the coating, the less protection the floor will have. On average, DIY flooring kits create a coating that is half the thickness of professional epoxy garage floor coatings in Chandler. DIY kits also recommend that you prepare the floor with acid etching instead of grinding since many homeowners are unlikely to rent the high-quality tools that are needed for grinding. But acid etching is quite dangerous. The acid can burn your skin, and you can become seriously ill by breathing in the fumes. You must wear the right safety equipment and practice strict caution when working with the acid. By hiring a professional epoxy flooring contractor, you get a much higher quality of floor coating. To start, the coating has a much thicker protective layer. Typically, professional-grade concrete floor coatings have 65 percent to 100 percent solids by volume, which means they have a final thickness of anywhere from 3 to 30 mils per coat. That thicker layer is going to be more resistant to wear and corrosion from foot or automotive traffic and chemical spills. A professional epoxy flooring contractor will also have professional tools to perform the job. That means the contractor will have a heavy-duty grinder to get the floor to the right level of abrasiveness – similar to an 80-grit sandpaper. That abrasiveness helps the coatings to adhere to the floor, which ensures the longevity of the coatings. Your contractor will also have the means to properly dispose of the debris from preparing the floor, including the fine, concrete dust that can prove toxic when inhaled. You don’t have to choose Chandler epoxy floor coatings to protect your concrete floors. You have the option to choose from concrete stains and sealers, or even a combo system. These coatings can make your concrete floors look more attractive while also covering them with a protective layer. Concrete stains and sealers do not sit on top of the surface, but rather sink into the concrete itself and bond with the material. Therefore, the floor does not require extensive preparation to accept the coating. The film also will not peel, flake or fade over time like epoxy has the potential to do. Yet this system remains resistant to chemical corrosion and tire pickup. To determine the right floor coating for your garage, work space, or living space, you really need to consult with a professional who can evaluate your needs and give you tailored recommendations for the space and your budget. What’s best for your garage might not be best for your living room, for example. By understanding the different options, you can make a more informed decision in conjunction with your contractor. The contractors at Barefoot Surfaces provide all types of concrete floor coatings for residential and commercial properties throughout Arizona. We offer stained and sealed concrete floorings in Chandler, decorative concrete overlays, metallic epoxies, and more. We also have experienced outdoor epoxy coating contractors in Chandler who can help bring your patio to life! We’ll help you determine the right kind of flooring to protect your floor and get the look you want. 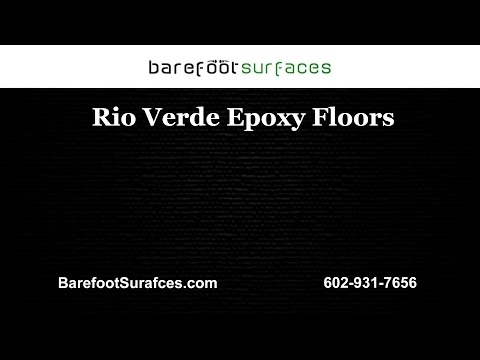 Call us in Arizona to learn more about our concrete floorings or to talk with an epoxy flooring contractor about the needs of your job.